Today, Buds by Shangri–La officially opens at the first floor of Shangri-La Hotel, Singapore’s newly rejuvenated Tower Wing. An interactive indoor and outdoor play space spanning 2,150 square metres in total, Buds by Shangri–La features specially curated installations to take younger guests on a journey of discovery through four key narratives: embracing nature, adventure, camaraderie and independence. Themed activity spaces encourage more fun learning: Muddy, for budding artists who like to make a splash; Stage, a music studio for young performers; Bake, a fully equipped cooking classroom for children and parents; and an interactive Party Room for celebrations. 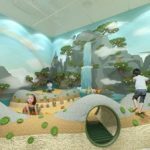 Children under four years old will enjoy the specially designed Toddler Zone inside Buds, with swings and slides, a piano floor, and soft wall buttons that produce animal sounds, a ball pit and vintage kiddie rides. Parents can relax at the Recharge café beside the Buds entrance and are assured of convenience and peace of mind with the use of radio-frequency identification (RFID) wristbands for children and natural organic materials. There is also a nursing room for mothers adjacent to Buds’ entrance. 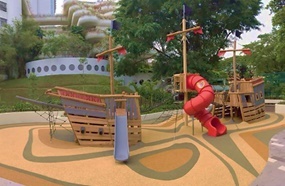 The fun extends outdoors, where kids can play make-believe inside a giant pirate ship structure offering challenging climbs and slides, and a water play zone with splash pads. Families can also enjoy the free-form outdoor swimming pool located in the centre of the hotel property, with its wading area and jet fountain, and delight in exploring the hotel’s luxurious sanctuary of lush gardens spanning 40,500 square metres. With the opening of Buds by Shangri–La, Shangri-La Hotel, Singapore strengthens its luxury family experience – integrating accommodations, child-friendly services and an interactive play area for children who are both hotel and non-hotel guests, to learn through play in a creative, self-directed and experiential environment and bond with their parents. Buds by Shangri–La is open daily from Monday to Sunday, 9am to 9pm indoors and 9am to 7pm outdoors. Guests can enquire about registration fees, classes, special activities and further information by emailing buds.sls@shangri-la.com or calling (65) 6213 4833 or 4844. 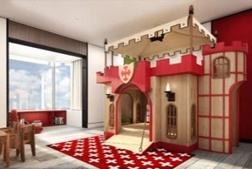 The ninth floor of the Tower Wing is dedicated to family travellers with a choice of five Themed Family Suites and 19 Deluxe Family Rooms for families of two adults and two children 12 years old and below. The floor has a centralised pantry with a steriliser, induction heater and children’s amenities that are available upon request through a dedicated family concierge. Each of the Themed Family Suites measures 72 square metres and offers an immersive space for children to sleep and dine, with unique whimsical interiors and dream–themed beds. The five themes include Safari, Treetop, Castle, Underwater and Space. The suites have two bathrooms, the larger of which is designed for children, additional shelving and storage space, a deep vanity sink for baby washing and space for nappy changing, as well as a pantry with an induction heater, a sink and a large refrigerator. A special feature of the Themed Family Suite is a connecting tunnel between the children’s bedroom and the parents’. Guests staying in the Themed Family Suites will also enjoy effortless in-room check-in, a dedicated family concierge service, and complimentary access to Buds by Shangri-La. At 38 square metres, the Deluxe Family Rooms include built-in beds to provide children with sleeping space without reducing the room size. Families will appreciate the additional storage space and comfort. In addition to creating a family-friendly atmosphere, Shangri-La Hotel, Singapore offers a range of exceptional childcare amenities from Stokke – the leading brand for children’s furniture and equipment – including car seats for airport transfers, strollers, travel cots and high chairs to smaller comfort items (bath time toys, bibs, thermometers, potties, nappy bins, sterilisers) and more. These are available upon request prior and during the stay, and at the hotel’s restaurants to ensure families travel light, check-in fast and dine in comfort. The Themed Family Suites start from S$900 per night, while the Deluxe Family Rooms start from S$430 per night. 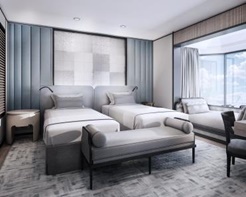 Guests can make reservations at www.shangri-la.com/singapore, by sending an email to reservations.sls@shangri-la.com or calling (65) 6235 1666.